The third – and last theatrically released – sequel in the ‘Hellraiser’ series begins in outer-space and acts as both prequel and sequel. As the former it’s an interesting take but as the latter it’s rather tame. Surprisingly, ‘Bloodline’ is marginally better than you might expect and starts off with an impressively shot opening sequence involving a robot summoning the demon, ‘Pinhead’. The movie is steeped in the mythos of LeMarchand’s Box (the box which opens the doorway to hell); and in fact, that box and the story of the family responsible for making the thing, are the stars of the film. Horror film fans will no doubt recognise Kim “A Nightmare on Elm Street Part 2 love-interest” Myers playing the wife of the latest in the cursed LeMarchand bloodline. In general though, the cast are dull and even the wonderful Doug Bradley’s one-liners are, by now, more annoying than playful. Besides the usual spattering of gore, there isn’t that much to keep anyone but the die-hards interested. 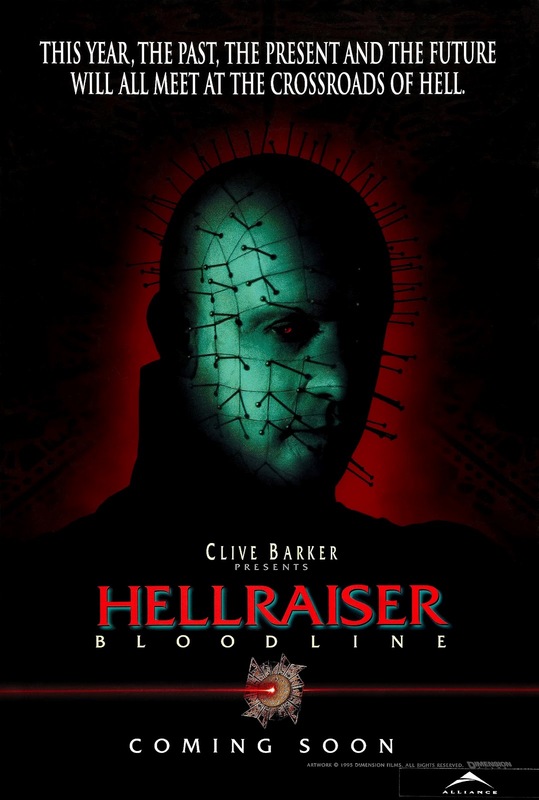 This entry was posted in Grant Davies, Hellraiser. Bookmark the permalink. This was hilariously bad especially Adam Scott's performance….Just like Leprechaun In Space or Jason X, when your villain goes to space, the franchise is dead and buried.